Reference 3525 was launched in 1939. An important breakthrough model for the firm, the reference featured one of Rolex’s most important technological advancements. It was Rolex's very first chronograph wristwatch to be housed in an Oyster case, and equipped with a water resistant screw down caseback along with screw down crown. Displaying a crisp and sharp case, this reference 3525 is fitted with a black lacquer dial and luminous hands and numerals. The model is affectionately called "Barilotto" as the case is similar to that of a barrel. 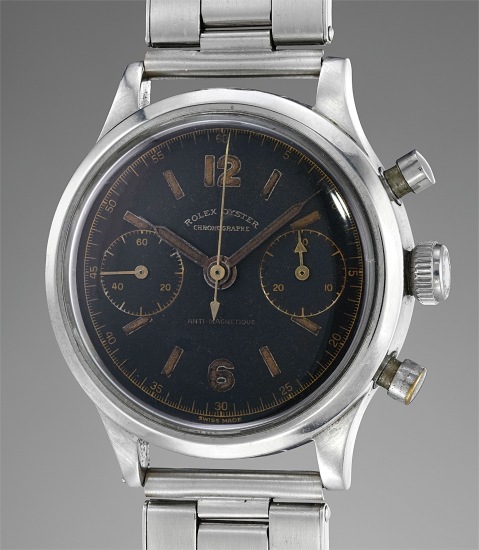 Legible and deep, the case number and reference number are particularly sharp on the outside caseback and would have disappeared with continuous polishing over the years. It is interesting to note that there are three stars stamped just above the case number which can also be found on other reference 3525s, the meaning of which is still unclear. This watch most interestingly displays very similar design specifications to the reference 3525 "Prisoner of War" watches that Rolex supplied to detained British army officers in WWII German war camps. These watches were often fitted with a black dial, gold graphics and luminous hands.